lead in All About Eve, encore broadcast to The Gateway Theatre Screen from the West End in London. Over the past decade The Simmertones have established themselves as on of the UK's leading authentic ska and reggae band. This nine piece band is sure to have you jumping with their infectious live sound. 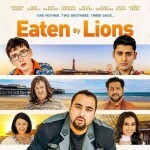 EATEN BY LIONS is the feel good movie of the year, a heart-warming story of half-brothers Omar (Antonia Aakeel) and Pete (Jack Carroll), who were raised by their Grandma after their parents were tragically killed by lions in a bizarre accident. The heartwarming comedy based on a true story of a group of Cornish Fisherman who went on to have a top ten hit. (The Sinner, Independence Day) star in Arthur Miller’s blistering drama All My Sons. This year sees Craig Morris & Gareth Lewis join together on their "Messages from Beyond" Tour. They will be working together for their 2nd uk tour on what is set to be exciting and uplifting. Carmen: Impetuous Carmen seduces Don José in order to convince him to let her out of jail. Petrushka: Fed up with this endless part that never goes well for him, Petrushka attacks his rival and flees from the puppets theater. on its portrayal of hierarchy and power. "I envy the Japanese" Van Gogh wrote to his brother Theo. In the exhibition on which this film is based VAN GOGH & JAPAN at the Van Gogh Museum in Amsterdam - one can see why. Though Vincent van Gogh never visited Japan it is the country that had the most profound influence on him and his art. Come along and join our highly popular Quiz evening. Get together with friends and test out your brainpower in a fun and friendly atmosphere whilst raising funds for The Gateway. Take That and get ready to party at The Gateway cinema as Gary, Mark and Howard bring their huge 2019 Greatest Hits tour to the big screen. This event has been pre-recorded live!. fun and emotion for all ages and,of course, magnificent music. André Rieu’s annual hometown Maastricht concerts attract fans from all corners of the globe. The medieval town square is transformed into a spectacular backdrop for unforgettable concerts filled with humour, fun and emotion for all ages and,of course, magnificent music. resonant today. Artistic Director, Gregory Doran, directs this new production. Starring Ed Sheeran, Lily James & James Corden. In the 'Patsy Cline & Friends' show, Sue Lowry's powerful renditions of classic songs like 'Sweet Dreams' and 'Crazy', as well as 'She's Got You' and 'Got A Lot Of Rhythm In My Soul', will take you back to the toe-tapping, honky-tonk days of pure country music. Cabaret style seating. A welcome return of this hugely popular choir who give their services to raise money for charities, tonight's performance is for us! Dowlais bring a selection of songs and give them their own style with beautiful harmonies throughout. Always a joyful evening, not to be missed! A 'Gateway' Fund Raising event. So excited to announce this gig! More than just an ordinary Pink Floyd tribute band, The Darkside of Pink Floyd entertain audiences with a fantastic light show and passionate performances. The Gateway is so excited to welcome back the amazing Riviera Dogs, a 5 piece band who deliver quality music guaranteed to keep you dancing all night! Europe's most explosive tribute to rock legends AC/DC. Blackballed are an English rock band from Manchester. the band tour extensively in the UK and Europe, including well-known festivals such as Beautiful Days and Bearded Theory. Due to overwhelming demand The Gateway is back with their much loved New Year Party ..helping us celebrate in style we have secured The Fab Beatles! Inclusive of Big Screen live link to the New Year Countdown.